Saudi Tabreed was established in 2006 as a joint venture with the regional player Tabreed in the UAE, having solid track record in owning, designing, building and operating district cooling (DC) schemes throughout the GCC since 1998. Today, it operates 67 DC plants with a total capacity of almost 1 million refrigeration tonnes (RT). The company is a leading player in Saudi Arabia with a portfolio of prestigious projects with key clients like Saudi Aramco in Dhahran, King Abdullah Financial Centre in Riyadh and Jabal Omar Development in Makkah, having a total capacity of 222,000 RT under Build Own Operate (BOO) / Build Own Transfer (BOT) and EPC-O frameworks. Including the addition of the new capacity of 35,000 RT via its new KKIA project to its portfolio, the company says. The company started with a vision of transforming energy efficiency platforms via DC, going through the learning curve of introducing the technological platform to the government and semi-government entities in Saudi Arabia and more importantly, the value-adds and advantages of adapting the DC platform versus conventional cooling systems. “I was fortunate enough to join Saudi Tabreed in January 2012 and worked on transforming the company to what it is today, having prestigious portfolio of projects and in excess of SR8.5 billion ($2.26 billion) of backlog,” says Saudi Tabreed CEO Kamal Pharran. Saudi Tabreed’s first project was with Saudi Aramco, where it was the result of a strong drive and commitment from Aramco for energy efficiency and green sustainable initiatives. “Our close collaboration with Aramco was highlighted in the 32,000 (RT) capacity district cooling (DC) scheme, which we completed successfully in mid-2012. Aramco’s DC scheme is one of our flagship developments when things come to our outsourced DC solutions. The scheme is covering the Dhahran area, the heart of Aramco facilities and management structure. We are very proud of this accomplishment and more importantly the trust streamed by Aramco management regarding our long-term partnership,” Pharran recalls. Amongst its most recent projects is the King Khaled International Airport in Riyadh. “It is indeed the jewel in the crown. It is one of the prestigious DC projects in Tabreed covering the GCC,” he adds. The 35,000 RT DC plant business model is quite interesting, where it involves an integration of existing assets with a state-of-the-art new plant, with capacities being upgraded as per the airport’s expansion timeline. “We took over the existing old DC plant supplying the airport area and its support facilities to enhance its efficiency. After two years’ time, we have to deliver the newly built DC plant to accommodate the expansion and replace the older plant gradually as we go ahead with the expansion timeline. This project is under BOT framework and a 30 years concession agreement. It is also the first time that a government entity outsources cooling requirements to a specialised developer. We hope that this project would set a quality benchmark for other government entities to adapt for their existing and future projects,” Pharran explains. Commenting on the state of development of DC in Saudi Arabia compared to other Gulf countries, Pharran says: “From the private sector perspective, the decision makers in this part of Saudi Arabia are starting to come round to the idea of DC and understand the value-added behind it. We have aligned our company with most of the private megaprojects in the kingdom. “However, to be more honest, it is indeed a challenging market. We are still working on enhancing the exposure of DC to the kingdom via different stakeholders. Projects bankability remains a big challenge, particularly the private sector, namely when talking about long-term project financing. “The off-taking agreements structure and framework is another challenge. We, in the kingdom, do not have a regulation to facilitate the use, implementation and financing of DC projects, yet. Our portfolio of projects was covered under long term financing with hand-picked clients, with whom banks feel comfortable dealing with. It is not always the case. The DC industry overall in the kingdom is not as matured as the industry in the UAE or even Qatar, he adds. “The Ministry of Water and Electricity is recognising how DC would help reduce the consumption of electricity and associated upfront investments in electricity and infrastructure. However, when things come to boots on the ground, nothing has been achieved from a DC facilitation perspective. “It is true that we are experiencing a fundamental change driven by energy efficiency and cost effective solutions, more importantly a need rather an interest. 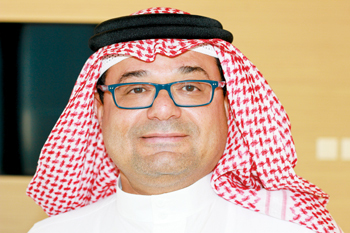 The market and stakeholders in the kingdom are still evolving and we hope fundamentals would help us further in reaching to more clients and end-users as the DC industry matures,” the CEO says. Listing the major challenges that DC faces in Saudi Arabia, Pharren says: When we talk about the full cycle of the development of a DC scheme, challenges remain in each and every component of the development. Financing, for example is very much linked to the credit worthiness of the developer/end-user. The BOO/BOT frame-work is very much structured for a single off-taker, provided he is capable of handling the financial commitments and more importantly is having the capacity to secure the financing. We are talking about financial history, shareholders credit worthiness, other banking facilities used. Another important component is the means by which the revenue is being collected. The billing cycle and the way payments are made. DC regulations are not yet in place to organise and streamline the relationship between the end-user and the developer. Hence billing and collection cycles are neither clear nor framed in a structure where responsibilities and limitations are addressed for both parties. Securing financing under private developments without a single off-taker is another obstacle. Availability of water connection points to any DC plant across the kingdom is a major challenge, which we are trying to solve and mitigate via alliances and partnerships with the different stakeholders. The kingdom is huge and resources required for a successful DC implementation are not necessary available everywhere. Let us say that we are ahead of the learning curve for DC from an awareness perspective. However, when things come to actual on ground facilitation and implementation for DC, we are still on square one, compared to other countries in the region. 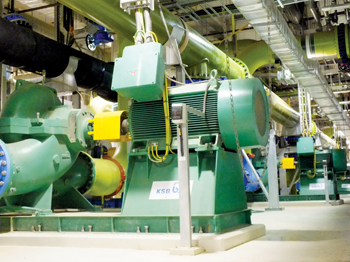 According to Pharran, DC, in general, can give upto 50 per cent upfront capital savings from electricity generation and associated infrastructure requirements in addition to the 40 per cent savings in power consumption throughout the life cycle of the DC assets compared to conventional cooling systems. “Our solid track record in owning, designing, building and operating district cooling schemes throughout the GCC since 1998, having a total of 60 plants with total capacity of almost 1 million RT is for sure one of our competitive advantages,” he says about Saudi Tabreed’s competitive edge. “More importantly, the appetite of Saudi Tabreed to invest long-term in the future of Saudi Arabia is an essential advantage. Our business model is under long-term BOO/BOT frameworks (25 or 30 years). We also have the ability to cut down the associated costs of 4 per cent from the project value paid to consultants with know-how coming originally via their former exposure to Tabreed’s engineering practices and extensive experience from executing DC projects. “Under BOO/BOT frameworks, design parameters and associated KPI’s regarding plants performances are actually guaranteed by the SPV owning the DC scheme, facilitated by the tariff paid by end-users via billing cycles. The BOO/BOT framework is covering the design risk, execution and construction risk, as well as operational and assets risk throughout the period of the concession agreement (25 or 30 years),” he explains. So, what’s next for Saudi Tabreed? “Our growth strategy is strongly aligned with the Kingdoms needs and requirements to further optimise energy consumption for cooling systems. Our main focus is on our outsourcing mechanism via long-term BOO/BOOT frameworks for our district cooling schemes throughout the kingdom, namely for mega projects,” says Pharren. District Cooling is an effective and sustainable key solution on energy optimisation for the kingdom, feels Pharran and adds: It’s the heart of its developments and key competency when things come to energy savings and proper utilisation of allocated budgets for spending and civil expansion. In fact, a mandate was already streamed via the Riyadh City Development Council to adapt DC solutions to any of the mega projects within the city of Riyadh. We expect the DC industry to evolve under the same mandate to cover all the cities in the kingdom, where government entities and real estate developers alike are mandated to introduce DC schemes in their current projects as well as futures plans. The collaboration with the Saudi Energy Efficiency Centre is, on the other hand, key as we go forward with DC implementations and regulations across the kingdom.